But doesn’t it fit with the team that has been all about overcoming obstacles and adversity all season, the team that shouldn’t? Hey, it’s their story and they’re sticking to it. And, after all, though trailing by 17 points in the first quarter, this was the second consecutive game the Bulls lost a double digit second half lead, this time leading 87-77 with 6:59 remaining in the game. But the Wizards with Bradley Beal scoring 26 points and Nene again crucial, especially with the first six points of overtime and 17 overall, caught a once again Scoreless in Chicago team of Bulls, who went the last 7:17 of regulation and then more than four minutes of overtime with just one field goal. That’s 11 minutes and 31 seconds down the stretch of perhaps the game to save the season with just one Kirk Hinrich jumper. The Wizards are a better defensive team than they were, sure, but they’re not the ’86 Bears. John Wall still hasn’t found his guy. But in Game 1 after leading by 13 in the third quarter and by five with 9:16 left, the Bulls made two field goals in the last 5:56 and the Wizards pulled away. And Tuesday even with yet another scoring drought that had the players seeing mirages like basketballs going into the basket that weren’t, the Bulls defended Beal into a miss at the end of regulation to go to overtime and then had Hinrich at the free throw line with a chance to tie the game with 2.4 seconds left in overtime. But Hinrich missed the first. He had to purposely miss the second. 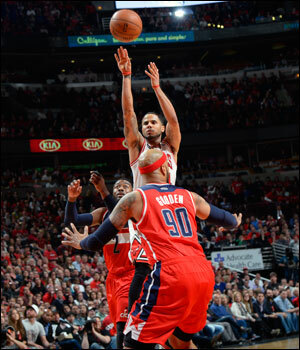 The ball rebounded to the Wizards to end the game. That will be one of the questions among many chewed over before Game 3 Friday in Washington. Though coach Tom Thibodeau yanked starters early when the Bulls were knocked back to start, Jimmy Butler played the entire 53 minutes with just six points. Augustin played a career playoff high 41 minutes while Noah went 46 minutes with 20 points and 12 rebounds. Taj Gibson had a career playoff high 22 points playing 36 minutes while Carlos Boozer played 21. The Wizards basically used seven players as well, so the issue can be debated. The other question that will be debated is the use of more offensive minded players, like Boozer and Mike Dunleavy, late in games when the Bulls have had trouble to score. “We look at everything,” Thibodeau said about different rotations. But Thibodeau is a consistent coach and this has been the rotation he’s used basically the last two months. He hasn’t played Boozer in the fourth quarters except if there was foul trouble, and he’s stayed with Augustin, who is not known as a strong defender, for scoring. And, in fact, it was Augustin who saved the Bulls early when he made a first quarter entrance along with Nazr Mohammed, Tony Snell and Gibson when the starters were overwhelmed. Augustin scored eight points in less than two minutes to bring the Bulls within 31-20 after the first quarter. Augustin opened the second quarter with another three and then it was on, a playoff game finally as the Bulls got within one and closed the half trailing 56-49. Hinrich grappled with Beal in the second quarter for double technicals and Noah and Trevor Ariza drew double technicals for some minor third quarter contretemps. But that’s supposed to be Bulls basketball, making your opponent feel you; and it’s not supposed to be Wizards basketball, or when the prettier, high scoring Wizards become muggles. But this time Beal made his shot, the Wizards got shooting off the bench from Martell Webster with a pair of threes and Trevor Booker going three of four and shut down Augustin, who was two of eight for five points in the last 17 minutes. The Wizards moved their best defender, Trevor Ariza, onto Augustin and mostly closed him out. So the Wizards went for defense as well, which perhaps is the larger issue for the Bulls. After all, they did lose their two best scorers and about 40 points with the absences of Derrick Rose and Luol Deng. When you overachieve it doesn’t mean you can continue, especially when it comes to the playoffs. Perhaps you only can reach the level of your talent. Thibodeau is a believer in the go with the guys who got you there, and he’s finished games with the same five as he ran it out with Tuesday, Augustin, Hinrich, Noah, Gibson and Butler. Augustin is the weakest of the defenders because of his size. So Thibodeau generally doesn’t like to add a second limited defender down the stretch in Boozer or Dunleavy. So it comes as it often does with the Bulls to the chicken or the egg, the chicken or an egg laid by the chicken, the chicken or an egg containing a chicken, or scoring more points or stopping them from scoring? Scientists, philosophers and Thibodeau have debated these questions for years. Thibodeau generally opts for the defensive stance given that is the Bulls’ identity and specialty. They are not a scoring team, especially without Rose and without someone who can create off the dribble. So you stop them and you should be able to score enough. With 93 points in Game 1 and 99 in Game 2, that generally is enough for the Bulls. But they gave up more than 100 each game, which is untypical, even if it took overtime in Game 2. In Thibodeau’s view—and he has been one of the league’s most successful coaches the last four years and top three in Coach of the Year voting in three of his four seasons—it’s the physical and tough plays that make the difference. So he cedes to defense. Stop them and you win. The way Thibodeau generally sees it is he needs Augustin in the game for scoring as Augustin is the team’s leading scorer. But it’s a compromise for the defense. You generally try to “hide” the poorest defender on a weak scorer, which for the Wizards would be Ariza. But given Ariza’s size, the fear is even if he couldn’t score he’d just take Augustin inside and control the rebounds. The Bulls came back and outrebounded the Wizards 49-42, had a 44-22 edge in points in the paint, 18-10 in second chance points and 17-8 in offensive rebounds, all improvements from Game 1 and presumably enough to win. The Thibodeau philosophy generally is with Augustin on the floor he has to stay with his stronger defenders, especially against a good offensive team. And Noah did a much better job on Nene, who didn’t really get loose until the overtime and Gibson’s second efforts sparked the offense and brought the Bulls back. And since the Wizards have such dynamic guards, it’s vital to have Hinrich on Wall, and Hinrich again kept Wall mostly quiet with 16 points on six of 15 shooting and five turnovers. Wall’s much too quick for Augustin, so he often had to defend Beal as well and Beal was hitting his shots after missing in Game 1. “We’ve come a long way from last year,” said Beal. So Thibodeau opted to go with his defense. After all, he presumably reasoned, it’s been what the team has relied upon, that when the Bulls have had late leads the defense, which is what they are known for, has held. The Bulls had a solid late lead. All they had to do is what they do best. But again they could not. The Bulls made some adjustments to counter the Wizards pressuring Noah by moving him to the baseline more and putting him on the move as well. It seemed to be working after the slow start as the Bulls took a 75-70 lead after three quarters. Augustin also is the best among the guards at pushing in transition without looking for a play call, and that seemed to energize the offense. Until the Wizards went with Ariza on Augustin. Still, the Bulls led by 10 midway through the fourth quarter. But Beal made big shots down the stretch to tie at 91 with 52.9 seconds left in regulation. Hinrich missed, Gibson rebounded and then Augustin missed. Gibson rebounded yet again but lost the ball and Beal missed a last attempt at a winner with Noah switching onto him. Noah pregame received his Defensive Player of the Year award from former winner Dikembe Mutombo. Mutombo even gave the Bulls a little postgame pep talk. And Noah showed what a defensive player winner was like. But Nene finally unhooked himself from Noah’s grasp to hit a pair of jumpers and a slam dunk after a turnover for a 97-91 Washington lead with 2:39 left in overtime. Still, the Bulls came back with Gibson’s rolling dunk on a Hinrich pass with 46.1 seconds left in overtime the Bulls first overtime field goal. 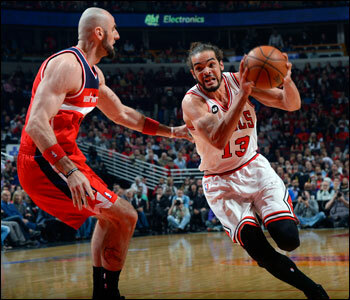 After two Wall free throws (Washington was 16 of 28 on free throws), Noah scored on a layup and was fouled, Wall committed an offensive foul when the Bulls pressured the inbounds and Noah was fouled with 34.7 seconds left on a Hinrich pass and made both. That put the Bulls behind 101-99. Beal missed a 15-footer and Hinrich got an opening as the Wizards were shading toward Augustin and were jumping his pick and roll with Noah. 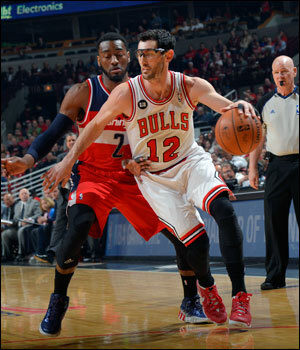 Hinrich was fouled with 2.4 seconds left, but he missed. And the Bulls have some coming back to do if they don’t want a distressing end to an unlikely season.